My name’s Azam Fatemi. I come from Saveh, a beautiful city in Iran’s Central Province. These days remind me of the throbbing days of summer 1981. They also take me back to the post-Revolution days of 1979. Those days, I was a high school student. I loved studying and I spent most of my time studying and reading books. Rug-weaving used to be very common in our family and among neighbors, and a large number of girls my age were involved in rug-weaving. But I was never satisfied with such works. A voice from within told me to get up and go look for the things I did not know, to learn new things, to have new experiences and to gain social knowledge. When I was 13, a number of my friends were arrested by the Shah’s SAVAK. Everybody knew those girls because they were so different. Their looks, their attitudes and what they did, all seemed so interesting to me. They were not like other girls living an ordinary life. They tried to have a say in political developments, at school and university. They looked for equality and freedom in society. I could see my own ideals and my own future in them. Finally, by following their model, I, too, started my own journey. Along with my sister who was only two years younger than me, we read books with our friends and we spoke about future and what it should have been. We spoke about our goals, ambitions and ideals. I was so happy, particularly because two of my brothers who were older than me, were of the same mind as me and followed the same ideals. Then came June 21, 1981. 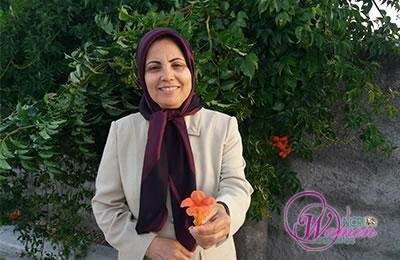 I was arrested in the course of a demonstration in our city, Saveh. I was imprisoned for nearly one year until my mother managed to deposit our house’s ownership documents and borrow money from the bank to pay as bail bond and secure my release from prison. After freedom from jail, life was completely different. Everything had a different meaning. I felt like I couldn’t sit idle and do nothing. I felt that my place was not there and I should not have stayed where there was no freedom, where countless number of youths were being killed every day, under torture or by firing squads! My place was in the ranks of a great resistance movement that wanted to topple the regime. I could no longer remain silent and watch what was happening in my country. I could not remain indifferent to the arrest of women or their expulsion from work and their marginalization. As a young woman, I had to imagine one by one, the faces of my mother, father, sisters and brothers and decide to leave them for good. For a future filled with hope, I had to leave my loved ones to be able to step into a new world which was unknown for me. I think such decisions are among the most fate making for anyone. It takes a few seconds to make such a decision, but they affect your whole life forever. In the final moments when I wanted to bid farewell, I was about to be overwhelmed by emotions. My memories began parading before my eyes like a movie. The moments of happiness and sorrow I had with those whom I loved most; my mother, my sisters and my dear brothers. But there was a voice within that told me these beauties can be even greater when there is freedom in Iran, and to achieve it I needed to struggle. With the help and backing I received from friends, I made my final decision and after that, I can remember that I did not even look back. I just picked up my bag and left home for a journey into future. 31 years on, I can summarize my life and struggle in just one sentence. Those who seek freedom, will find it by struggling for it and of course by paying its price. My two brothers, Hossein and Mohsen Fatemi were executed in the 1980s, in the massacre of political prisoners.